When I woke up, I was fairly bleary, so I decided to take a shower. While I was in the shower, John went and bought me breakfast. He got me and mocha and a biscotti, and given my condition, it was almost exactly the right breakfast. As I sipped and ate, I happened to glance out the window, and saw an entire herd of buffalo grazing along the backside of the hotel. John and I hurried out with the camera, and wandered through the maze of corridors in the hotel, popping out of doors in unexpected places, and finally ending up on a balcony just above the great, big beasts. I snapped a couple pictures from above, not really wanting to get too close to the animals after all the warnings about park visitors getting gored by buffalo. It was, however, interesting to get that close to the creatures. I could hear the crunching of the grass between their jaws, and hear their breathing and see the curly, tangled mass of their brown fur. After that little adventure, we packed everything up and loaded it all into the car before checking out of the Lodge. When we checked out, I noted the time for the next geyser event, and we had time for the gift shop before Old Faithful was going to perform again. We both knew that we wanted to return to the park, so I bought a couple of books on the hiking trails in the park. We then went out to look at Old Faithful, and stood there for 20 minutes before we gave up again. I guess we just got lucky the first time, or the geyser is shy of cameras, because I forgot my camera the first time, but brought it both times afterwards. We watched the buffalo as we drove away from the Lodge, and as we left the area proper, I saw one buffalo just behind one of the park signs. The sign was nearly seven feet tall, and the buffalo, at the shoulder, was nearly as tall as the sign. It was just huge. It also startled John significantly, as he hadn't seen it, because it was behind the sign. He had also been looking at the steaming springs to the left, so had only glanced to the right, before getting a good look. We drove by before I could snap a picture. John almost turned back, but I told him not to. It turned out that there were buffalo and elk all over the place as we started to drive to the exit. 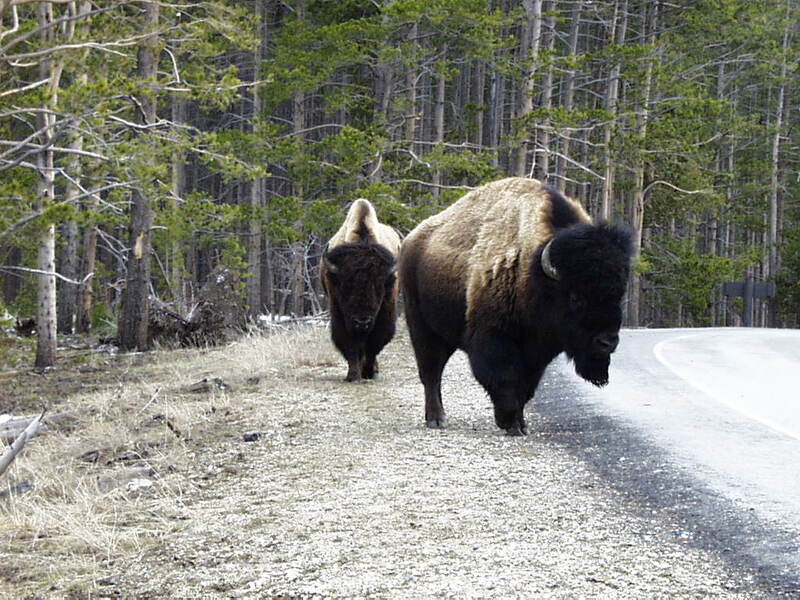 All the large mammals were in the open spaces, and on the roads. The snow was about knee deep in the woods that we did see, so I could see why they'd choose the open roads. We pulled over to see a series of steaming mineral springs that left rainbows on the banks of a flowing river, and right at the turnoff were two large buffalo, right on the road's edge. We stopped right in the turnout, and I rolled down my window to take the picture. The buffalo eyed me warily and turned to the side to get a better look at me. So, I snapped the picture and we rolled on. After the mocha, I was glad of the pit toilets at the steaming springs. After the trip down the Rogue River, a few years ago, I have actually come to some understanding with pit toilets. When they are a necessity, it is good to have them. That isn't something I would've said ten years ago. Nearly ninety percent of the forests that we drove past during the trip through the park were burned. That was a shocking amount. It probably made it easier on the large mammals to travel through the park and find food. It also made it easier to see the geographical features of the park. In the hills surrounding Old Faithful, most of the forest had burned. It was, however, also very evident that the area was recovering. 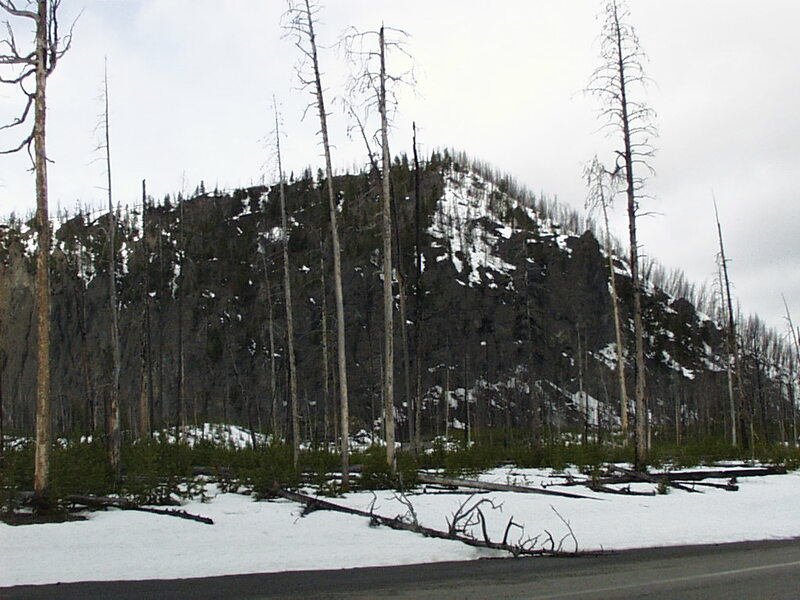 Everywhere there were black skeletons of burned trees, there was also a blanket of baby trees, lush, green, and thickly scattered under the scarred remains of what had once been tall forests. Since it was still early in the spring season, the south and east entrances to the park were still closed. So we had to leave through the West entrance, and then travel around the park to get to where we were going. We actually went west, back into Idaho, and then south towards Jackson's Hole. That part of Idaho was still snow covered, flat as far as the eye could see, and completely isolated. As we got towards Jackson's Hole, though, the roads got more mountainous. We stopped there for lunch, and walked through a lot of the shopping areas in the downtown area. There was the Big Dogs store that had a sale going, so we stopped there and bought John a bright print shirt and a fleece that was warm against the cold. Lunch, itself, was at a local brew pub that served fairly good food. I was still exhausted from the sleepless night, and tired of traveling. So, around this point we decided to we might as well go straight for home. We looked up the nearest Interstates, and headed right for them. I took the wheel around here, and went like a bat out of hell along all the curving mountain roads, on a beeline for the Interstates. Once we hit 80, we just headed straight east across Wyoming as the day grew darker. We hit the rocky, barren areas of Wyoming just as night fell, and stopped for dinner somewhere in the middle of nowhere. We were just three hours away from home, so John took the wheel and we just kept going. As we were about to hit Cheyenne, we noticed lights up in the sky, and we thought it was Cheyenne. The road, however, took a turned to the north, and we saw Cheyenne spread before us. The lights we saw to the south were actually the lights of Denver, nearly 60 miles away! I think it's going to take it while for me to get used to the visibility of this place.